Indonesia slammed on Monday the European Commission’s adoption of a draft regulation to phase out the use of palm oil in renewable transportation fuel and warned the move could hurt relations with EU members backing the proposal. Indonesia’s central bank is widely expected to keep interest rates unchanged for a fourth straight month on Thursday, despite inflation falling to its lowest pace in nearly a decade, a Reuters poll showed. Bank Indonesia Governor Perry Warjiyo said the government and the central bank had pegged the target for the tourism sector’s foreign exchange this year at US$17.6 million. The National Disaster Management Agency (BNPB) explained flash floods in Sentani, Jayapura were triggered by extreme downpours and forest damage. NTA East Indonesia Aid works to reduce poverty in the rural communities of Indonesia’s East Nusa Tenggara province, one of the poorest parts of the Indonesian archipelago. In the islands of West Timor and Flores, where NTA works, 30% of people live below the national poverty line. The Ministry of Home Affairs has expressed readiness to integrate e-planning and e-budgeting in an effort to synchronize policies and programs between regional and central governments. The Corruption Eradication Commission (KPK) has seized hundreds of millions of cash in rupiah and dollar during its search in the office of Religious Affairs Minister Lukman Hakim Saifuddin today, March 18. In the first vice presidential debate in Indonesia leading up to the April 17 elections, both candidates — businessman Sandiaga Uno and renowned Islamic cleric Ma’ruf Amin — agreed on one problem: Indonesia’s education system needs repairs. Industry Minister Airlangga Hartarto said that the ministry’s link and match program between vocational schools (SMK) and the industry would be a basis of education reform at SMK that was expected to open up bigger job opportunities for their alumni. The Jakarta Interbank Spot Dollar Rate recorded that the rupiah was quoted at Rp14,239 or rose 21 points from the previous Rp14,260 per US dollar on Monday afternoon as world oil prices fell. The British like to drink tea and the Brazilians love to play soccer. Every country has stereotypes attached to it, and while we must take each stereotype with a pinch of salt, there is usually a grain of truth behind why a country is perceived in a certain way. Coordinating Minister for Economic Affairs Darmin Nasution said Indonesia and Malaysia had agreed to send their envoys to protest the European Union’s plans to ban palm oil as biofuel by 2030 as noted in the draft of EU’s Delegation Act. The Ministry of Home Affairs prohibits regional heads, members of the provincial and district/city legislative bodies (DPRD), as well as the ministry and regional governments’ officials to go abroad during the election period, in order to support increased voter participation. Amid tough global market challenges, the country’s palm oil producers have to start expanding in the domestic market in order to boost absorption and stay afloat. Heavy rainfall has been affecting nine sub-districts in Sentani District (Jayapura Regency, Papua Province) since 16 March, triggering flash floods and landslides that resulted in casualties and damage. Industry Minister Airlangga Hartarto is optimistic the exports of footwear products will increase to US$6.5 billion this year and reach $10 billion in the next four years. In opening the truck drivers’ safety declaration at Tanjung Priok port, President Joko “Jokowi” Widodo recalled his late father’s profession as a truck and bus driver, who he considers being a noble profession. Indonesia’s Ministry of Tourism declared its participation at the 2019 MATTA Fair, that closed Sunday, a resounding success as exhibitors promoted new travel options to emerging destinations in Indonesia. In what has become a pattern for this year’s series of presidential election debates, observers and activists have expressed their disappointment with the lack of attention that many key healthcare, education, manpower, and sociocultural issues received. President Joko Widodo stipulates that salary adjustments for civil servants (PNS) starting January 1, 2019, will also apply to prospective civil servants (CPNS). Vice presidential candidates Ma’ruf Amin and Sandiaga Uno did their best to explain their plans to solve the issue of productive age unemployment rate in the presidential debate’s final session on Sunday, March 17. Foreign Minister Retno Marsudi summoned resident Australian Ambassador Gary Quinlan on Monday in response to the uninformed comments of a right-wing Australian senator over last week’s mosque shootings in New Zealand. 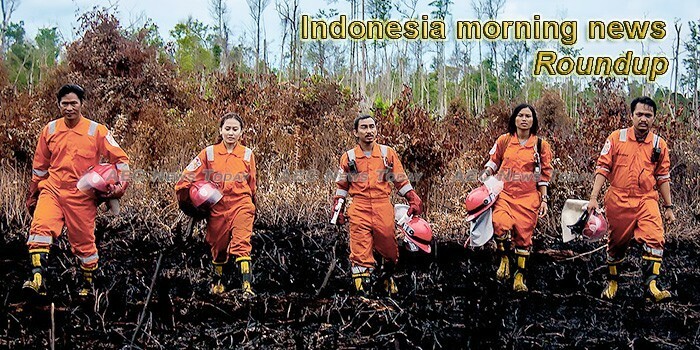 This week’s Indonesia morning news feature photo acknowledges International Day of Forest, March 21.